Primark nail kit. UNICORN QUEENFalse Nails - 24 nails with adhesive. Stunning unicorn with gems and twists Design Nails. 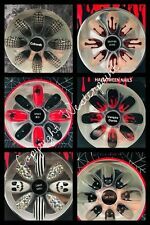 Halloween False Nails Condition is New. Dispatched with Royal Mail 2nd Class Large Letter. Primark False Nails - Metallic Holographic disney UV Gel Stick on Nail Glue . Condition is New. Dispatched with Royal Mail 2nd Class Large Letter. Pointed shape jewelled design. 24 nails with adhesive. Ocean design. Primark nail kit. Pineapple Crush False Nails - 24 nails with adhesive. Stunning Pineapple Design Nails. BNIP PRIMARK CHROMING & DOTTY WITH ADHESIVE. THE OTHER IS DOTTY EDIT. 1 IS CHROMING GALATIC. WHICH HAS HIGH SHINE UV GEL COATING. BOO SPIDER'S PUMPKIN VAMPIRE AND EYE. INCLUDES FREE GLUE. Stunning Fashion False Nails by Primark. This range is Sea Breeze (Beautiful Blue colour ) Pointed - Matte. 24 Nails with adhesive. Primark False Glitter Nails Sparkle Queen. Condition is New. Dispatched with Royal Mail 1st Class Large Letter. Pointed shape jewelled design. 24 nails with adhesive. Nail glue 2g. Galaxye design. Pointed shape jewelled design. 24 nails with adhesive. Pink Princess design. Primark Disney Minnie Mouse Nails. 24 in pack, adhesive not included. Beauty & The Beast False Nails From Primark, Glue Not Included In Pack But I Will Send A Spare One I Have :) Dispatched with Royal Mail 2nd Class.